PA10-300W power amplifier 10W in, 300W out 1.8-54 MHz with LPF. 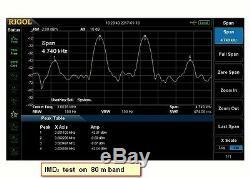 This device is designed for use with SDR radios , like ANAN-10, FLEX-1500 or others. With 6 to 8 W input power from SDR it runs solid 300W to your antenna. The amplifier's output is filtered by LPF with diplexer, so the second and higher harmonics of transmitted signal are suppressed for more than -47 dBc. 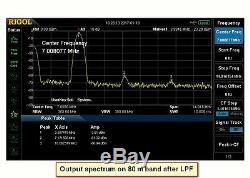 To switch the filters you need simple open-collector circuit of SDR or external switch. 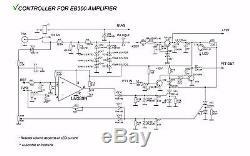 This amplifier may be used with QRP transceivers like FT-817 or IC-703 (with automatic band decoder) also. Active elements are matched pair of VRF2933 MOSFET transistors (see schematic) in AB-class. 2-tone measured IMD3 is -40 dBc. 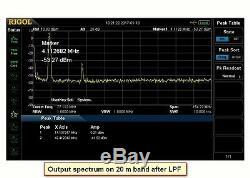 Measured by KC901H network analyser suppression of second and third harmonics (amplifier with diplexer) is: 10 meters 2nd -52 dB 3rd -55 dB 20 meters 2nd -54 dB 3rd -47 dB 80 meters 2nd -53 dB 3rd -51 dB. The power supply requirements is 50V 10 - 12A. Board size 190 x 165 mm. This controller is intended to control the EB300 300W HF power amplifier and protect it from. 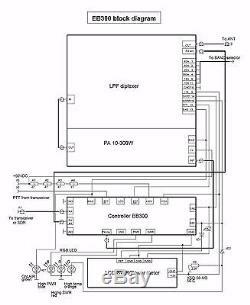 If any protection circuit works, it switches off the output transistors VRF2933 BIAS voltage first, reducing output power to zero and turns amplifier into RX mode. Then driver output disconnects from PA input and connects to antenna. Controllers input has -4 dB attenuator and voltage suppressor diodes to limit RF voltage on PA input at 15V level. Max input power level may be set by trimmer R17. Max output power level may be set by R22. VSWR threshold is initially set to 2.0:1 and may be varied by R20. SWR protection circuit fires SWR LED when engaged and power protection (both input and output) PWR LED. Front panel LCD indicator can be. Extinguished in addition to warn about emergency. Controller has internal voltage regulator and can be connected to +50 VDC line or powered from any +12 VDC source. To reset the controller the power supply voltage must be switched off then on again. 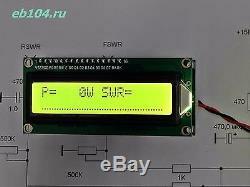 LCD power SWR meter 300W. The device is designed to display on the LCD alphanumeric display the values of the forward power and VSWR. Minimum voltage from directional coupler (SWR bridge) +2.55V. For proper operation the device requires calibration. Calibrate the Power Meter reading with trimpot FWR on reference instrument. Calibrate the readings SWR by REW trimpot on the reference meter connected in series to the antenna or using the load with known resistance , such as 100 ohms. In this case, the VSWR set to 2.0:1. Several pre-programmed or user selectable with MENU button (not provided) full-scale power levels are available, please inform what you need when order. Max indicating SWR 9.9:1. 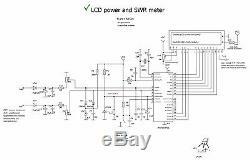 Use SWR bridge on LPF board. Has ports to connect LED and buzzer for alarm when SWR rise up to 3.0:1 and higher. Size 30 x 35 x 80 mm. Resistors, connectors and wire for interconnection. The item "HF power amplifier KIT MOSFET VRF2933 LPF 300W 1.8-54MHz with control and LCD" is in sale since Tuesday, October 25, 2016. This item is in the category "Consumer Electronics\Radio Communication\Ham, Amateur Radio\Ham Radio Amplifiers". The seller is "y_r3kbo" and is located in Voronezh, default. This item can be shipped worldwide.